They would both have special powers. Enya would have the special power to be Irish and Rod Stewart would have the special power to be blonde. Enya would also to be able to climb ropes. Of course, every crime fighting duo needs a special car, so they should be able borrow The Knight Rider or The Dukes of Hazzard's car. They would also need to have special code names to protect their identities. Rod Stewart's special code name would be 'The Turk', taken from his song 'Young Turks'. And Enya's special code name would be, err... Orinoco. The first episode would be the one about the strange mystery of the celebrity hair, which gets up to all sort of bad stuff whilst its owners are asleep. Alice Cooper's hair has been stealing limos and driving them into swimming pools. Paul McCartney's hair has been trying to strangle passing motorists. And Prince has got so fed up with his strange hair going out in the middle of the night and stealing soft furnishings from department stores that he has been forced to turn to Rod Stewart and Enya for help. So Rod Stewart and Enya set about investigating the strange case. Rod Stewart goes out to rough up a few hairdressers to see if he can get any information out of them. Meanwhile Enya stays indoors and does some research, because she's a girl. Suddenly Rod Stewart and Enya get the break they've been waiting for. 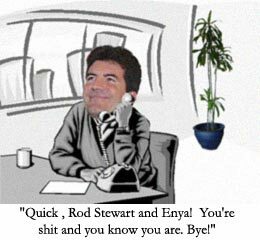 Their boss, pop impresario Simon Callow Cowell phones them up to tell them that The Pet Shop Boys have been spotted up to no good in the High Street. Then there would be a commercial break. There would be ads for dog food and water filters, and possibly even car insurance. 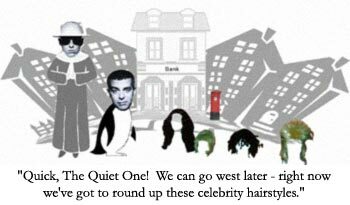 After the commercial break we would join Neil and The Quiet One from The Pet Shop Boys as they prepared the rob the town bank by using specially trained celebrity hairstyles to sneak in through the ventilation ducts and turn off all the alarms. Perhaps you could have their top pop hit 'It is a Sin' playing in the background to emphasise that they are doing bad things. 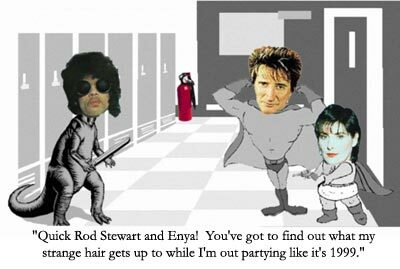 Anyway, before they are able to carry out their dastardly plan, Rod Stewart and Enya would arrive to save the day. Hurrah! I haven't worked out exactly how they would do this yet, but I should imagine it would have to be something pretty dramatic. Maybe Rod Stewart could have a sword fight with Neil, and Enya could swing down on a rope and get The Quiet One in a headlock. Yes, that would be good. Afterwards, everybody would be really pleased that Rod Stewart and Enya had won the big fight, and there would be medals and awards and things. But Rod Stewart and Enya would just slip away quietly to continue the fight against bad guys and pursue their jet set lifestyles. 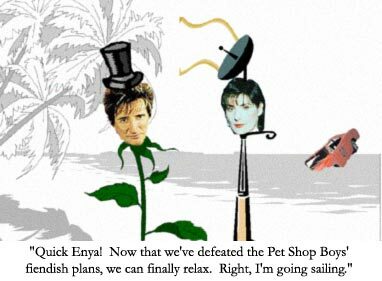 The last scene would show them walking down an exotic beach, and Rod Stewart would turn to Enya and come out with a slightly amusing quip - some kind of pun about 'pets' or 'shops' or something. Then they would both laugh and walk off into the distance, to get ready for episode two. I hope you like this story, but you must remember that it is copyright © Me, so you must ask my permission if you want to do it. Also, you might have to ask permission from Rod Stewart and Enya, I don't know really. I shouldn't think they'd mind though, because it is dead good.